* This DLL is written in C#, mIRC compatibility made possible with DllExport package. * A custom shortcut will be placed in the user's start menu; this is required by Windows for operation. That's a perfect and modern project/DLL, really good work. 60 = Will determine that how many seconds will the notification box will stay active before goes in notifications bar. You can't set a discrete value for duration, it's limited to short|long (7 or 25 seconds respectively). By using ShowToastXml this (and all other) elements can already be set. I'll expose 'duration' and 'scenario' to ShowToastJson, but since neither of these are recommended for use (ref) and to keep ShowToast simple, if you want to use any custom attributes use ShowToastXml or ShowToastJson. All is fine, but I can't call the callbacks when I'm using ShowToastXml. then using ShowToastXml the callback returns: tag string, where string is TimedOut (when is clicked every button from the toast or single/double/right clicked) or UserCanceled (when is clicked the close button from the Toast). 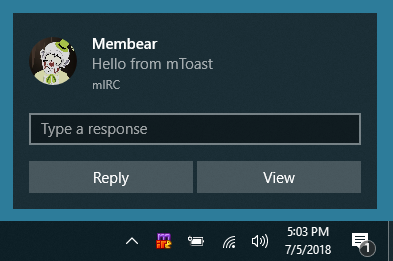 I tried to use any forms of callback=mToast.callback in XML as given in your examples from the script file, but nothing works, excepts TimedOut or UserCanceled.